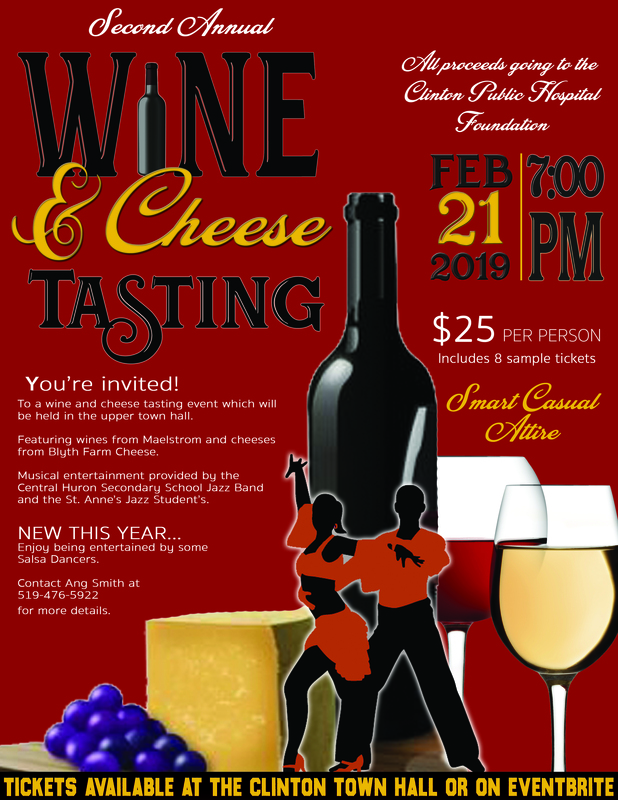 The Municipality of Central Huron is hosting their second annual Wine & Cheese Tasting, with this year’s proceeds being donated to the Clinton Public Hospital Foundation. The event will take place at 7pm on Thursday, February 21st, in the upper level of the Town Hall. Please join us for an evening of great local wines and cheeses, in an elegant historic venue, in support of the Clinton Public Hospital. Tickets are $25 per person, which include 8 sample tickets. This year’s tasting features wines from Maelstrom Winery and cheeses from Blyth Farm Cheese. Musical entertainment will be provided by the Central Huron Secondary School Jazz Band and the St. Anne’s Catholic Secondary School students. New this year, we will also be entertained by some Salsa Dancers. To purchase your ticket, you may do so online through Eventbrite, at the Foundation Office (please call ahead to ensure the office is open) and from the Clinton Town Hall. For more details, please contact Ang Smith at 519-476-5922 or angela.smith@centralhuron.com. Thank you to the Municipality of Central Huron for supporting the Clinton Public Hospital, through this wonderful fundraising event.